Advertising account manager performs the duties of communicating on behalf of the advertising company with all those companies which want their products to be promoted. They understand the marketing requirements of the company and explain these requirements to the creative team. These are the professional individuals who are considered as an important part of the advertising agency. Whenever an advertising account manager gets an opportunity to work at a better position in any other company, he has a right to join it. In such a situation he is required to notify the advertising agency about his decision of working somewhere else. The best way to inform your potential employer about your decision is to write a resignation letter. A resignation letter is a formal way by which you can announce your resignation. It is a basic document that you are required to provide to your employer even if you have discussed it before. It is important for a professional person to maintain a positive relationship with the employer even after leaving the job. Resignation letter written with the positive tone can put a very positive impression on your employer. 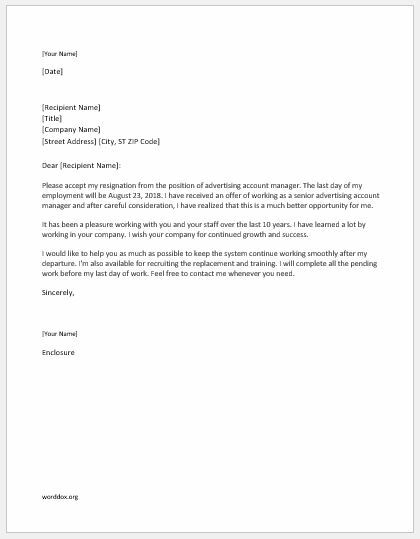 Read below a sample resignation letter in order to resign from your job as advertising account manager. Please accept my resignation from the position of advertising account manager. The last day of my employment will be August 23, 2018. I have received an offer of working as a senior advertising account manager and after careful consideration, I have realized that this is a much better opportunity for me. It has been a pleasure working with you and your staff over the last 10 years. I have learned a lot by working in your company. I wish your company for continued growth and success. I would like to help you as much as possible to keep the system continue working smoothly after my departure. I’m also available for recruiting the replacement and training. I will complete all the pending work before my last day of work. Feel free to contact me whenever you need.